In a previous article I covered the two most common control sensors in HVAC — Enthalpy and Dry Bulb (What Are HVAC Enthalpy & Dry Bulb – Part 1). In this one I’d like to discuss Carbon Dioxide (CO2) controls. No, this is not a debate for, or against global warming. The example is offered to explain how a cooling & heating strategy can be derived using this fact. ASHRAE has set forth fresh outside air demands to which we must comply. Heating and cooling a space is simpler during unoccupied hours. During unoccupied hours we are not required to burden our rooftop units with the need to integrate, and condition outside air. During occupied hours, we must comply. You can avoid the need to fulfill the ASHRAE requirements for outside air during occupied hours If the space is not consistently occupied! It’s called on-demand ventilation. By incorporating CO2 sensors into your design strategy, you need only to introduce fresh air into a space when above normal CO2 levels are detected from people entering and occupying the space. This strategy can be applied to conference rooms, cafeterias, classrooms, large rooms of worship, and auditoriums used occasionally throughout the day, or week. CO2 is a natural part of the atmosphere. A CO2 air sample is expressed as parts per million (ppm) — The number of CO2 molecules, per million molecules of air. CO2 concentrations in outdoor air typically range from 300 to 500 ppm. 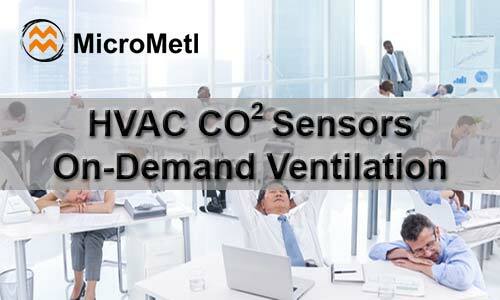 CO2 concentration is not a reliable indicator of an overall building’s air quality, but when using a Demand Control Ventilation scheme, will work as a gauge to measure fresh air integration and general air quality. If You Think The Room Smells Now… Just Wait! I was always under the assumption that high CO2 levels only effected mental concentration and general health. However, much of my research uncovered that odors become more prevalent at 600 ppm and higher. Volatile Organic Compounds (VOC) are gases emitted into the air we breathe from different materials. According to the Environmental Protection Agency (EPA), the concentration of many VOCs is consistently up to ten times higher indoors than outdoors. VOCs are detectable by smell, and are heightened as indoor CO2 levels increase. The biggest potential for energy savings with DCV can result in spaces that vary widely in occupancy levels. I will not for the purposes of supporting this article attempt to provide a specific percentage of savings resulting from the integration of DCV into your controls systems. I will tell you the savings can be significant! I currently attend a church that conditions a large gym used for the school and Sunday Services 24/7. Fresh air is introduced into the gym using external actuator controlled dampers only (no economizers or ERVs). The staff is convinced if the company maintaining the HVAC contract thought they needed them, they would have been installed. Their faith in the mechanical company who is not properly communicating, or does not care, is costing this church big money in energy costs. I urge contractors to inform building managers of changes in code, and inform them of the potential saving when investing in new, or updated HVAC technology.